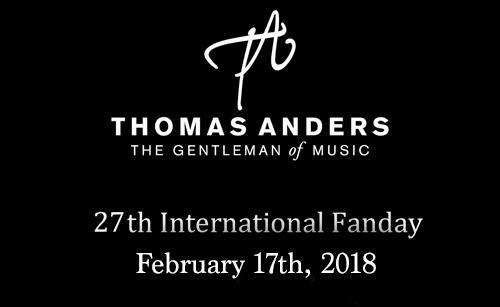 Details for the 27. International Fanday - Newsletter January 2018 - Thomas Anders Online - Die offizielle Fanpage! I would like to wish you a very happy and healthy New Year! Hopefully you were able to enjoy the holidays and the time between the years with your loved ones. Here in Koblenz we are creating the details for 27. International Fanday which takes place on 17th Feburay 2018 in the „Stadthalle Ransbach-Baumbach, Germany. The time for the official entrance has changed. We will open the doors at 11:00 am for you. As usual we will start with our handicaped guests and families with small children.The entrance for these guests is a special entrance which is located on the left hand side of the main entrance. After supporting these guests, we will open the main entrance. I´m expecting many guests at the Fanday and I would like to offer everybody the opportunity to take a photo with me. Therefore it is absolutely necessary that I can sign max.3 photos, albums or whatever in total. You will receive a number which will help you later to find your photo. You will receive your photo in the break between 6:00 and 7:30 pm at the same place where we have shoot the photos. We will print the photos in the order of as they were made. Of course our team is available to support you. Like usual we will raise a fee of 6.00 € for each pic. I have a lot of news for you and I´m more than happy to inform you on the Fanday. Mr. Chris Kub will our host in the afternoon again. We will have some surprises for you and of course „Modern Cooking“ will take an important part. Beside this I will present three new songs and of course we have very attractive prices in our raffle. Important note: We will be „live“ on Facebook. For those of my fans who cannot join us in Ransbach-Baumbach. You will find detailed informations on Friday, 16th Feburary on Facebook at which time the interaction takes place. At 6:00 pm the Fanday afternoon will end and we will ask you to leave the party for a short refreshing, for a snack or some merch, because we need the time for stage settings. Starting by 8:00 pm I will present my new stage programm where you will find some of your music wishes from our Facebook survey. I ´m looking forward to see you at the Fanday.